From "The Economist" December 19, 2015 edition. "The Black Chamber: The man who made Edward Snowden inevitable." "IT WAS a shocking disclosure that made headlines around the world. An American intelligence professional revealed the existence of a secret American bureau, which obtained, decoded and read the private messages of nearly 20 foreign governments. He disclosed methods of surveillance and subterfuge, describing a clandestine world of pilfered telegrams, forged wax seals and invisible inks. Laws had been broken and the privacy of many intruded upon. Telecommunications companies had co-operated secretly with the government. America’s past and future enemies learned how their encrypted messages had been read. 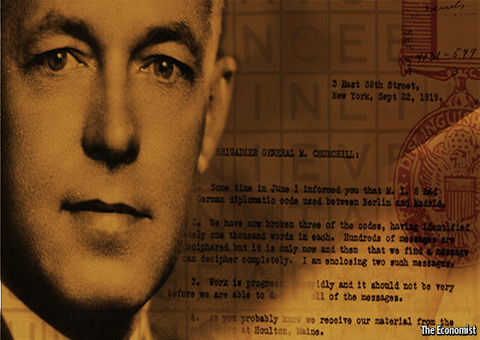 When in 1931 Herbert Yardley spilled the secrets of America’s eavesdropping programme, he may well have endangered national security. But, unlike Edward Snowden, he was no mid-level whistleblower shocked at the excesses of a lawless surveillance state. Yardley was the proud father of that surveillance state, creating the forerunner of the National Security Agency. He published a blockbuster book after the government decided that reading private messages was not in keeping with American values and shut his clandestine operation.